Sometimes people confuse talent with potential. Potential is aptitude not yet realized, but talent is an expression which is right in front of us. Yes, talent can be reigned in, developed, focused, nurtured, etc. But the real question of the day is, can we recognize talent when it does something a little bit left of normal. I guess we’ll find out in today’s Theatrical Tuesday review. Damien Chazelle is an American film director and screenwriter. He has currently served up only two feature-length films, but at thirty-one he is making a name for himself and about to release a movie called La La Land which I personally am very excited about. And the major reason for this is that Chazelle knows something about music that not many directors seem to be capable in pulling off. When you tie in the emotional and mental endurance needed to create art, people gravitate to that struggle and can see a story through to it’s conclusion. Which is where Whiplash comes in, as Chazelle’s second effort, and preceded by the jazz musical Guy and Madeline on a Park Bench, we get to see an excellent sparing match between Miles Teller and J. K. Simmons. Though this movie was technically released almost two years back now, I’m anticipating that 2016’s La La Land will have a similar rhythm to it. Pun intended. The movie starts with the struggle of a young jazz drummer named Andrew Neiman (Miles Teller) and his journey through school at a top music conservatory in New York called Shaffer Conservatory. Infamous and tyrannical conductor Terence Fletcher (J. K. Simmons) stumbles upon Nieman practicing late at night and is eventually convinced to invite Nieman into his studio band after a few awkward interactions. But Fletcher is relentless and expects the absolute best of his students, pushing them around both verbally and physically, kicking individuals out on a whim. Nieman practices so hard that his hands start to bleed, and he even breaks up with girlfriend Nicole (Melissa Benoist) because he wants to be the very best. At one point we sympathize with Fletcher because he shares that a former student of his recently died in a car crash, a student with tremendous potential, and who was quickly rising up. Which is foreshadowing for Niemans own car crash. In a rush to a competition due a broke down bus, Nieman rents a car, but forgets his sticks at the rental agency. He then rushes back and is t-boned by a large truck. Instead of seeking medical attention, he runs to the concert hall and attempts to play the piece, but cannot due to injury. Fletcher boots him from the stage, but not before Nieman attacks Fletcher in front of the audience. After being dismissed from the conservatory, Nieman and his father (Paul Reiser) meet with a lawyer of the student that died in a car crash. It turns out that the young man hanged himself, and that Fletcher pushed the student to anxiety and depression. Nieman chooses to testify, if only to remain anonymous. He later stumbles upon Fletcher performing at a jazz club, and is invited to a drink afterwards. Fletcher has been removed from his position, but he wants Nieman to be his drummer for a JVC Jazz Festival. Nieman agrees, but when he shows up to play Whiplash, Fletcher reveals that he knew Nieman testified against him, and has set him up for embarassment. Nieman walks off the stage, but then returns to the stage and starts up Caravan, bringing the rest of the band in with him, and finishes the song with a solo. Nieman and Fletcher share a look, then work together to finish the set. Pros: The movies asks the question, what are you willing to do in order to achieve greatness?, and rather deftly answers it. The two leads share an amazing set of performances and obliterate the typical student-mentor relationship trope. Cons: We never really get to enjoy any music, which is ironic, given that it’s a movie about music. Also, the message is rather linear in it’s presentation, not much room for a supporting cast to move around. Points of Interest: The film was edited, shot, and submitted to the Sundance Film Festival in a period of ten weeks. Andrew Nieman is in every scene. It was adapted from a short film of the same name, J. K. Simmons plays in both. This isn’t the first time we’ve seen this kind of story before. If we traded a studio band for uniforms and the drum kit for a football, boom we’d be in a sports movie. Or conversely, we could trade the studio band for a war zone and the drum kit for a rifle and all of a sudden it’s a war epic. But to spit some cheese, the song remains the same. Chazelle has done something here, something authentic, pulling from his own experience, and showing us what happens when someone really wants greatness at any cost. 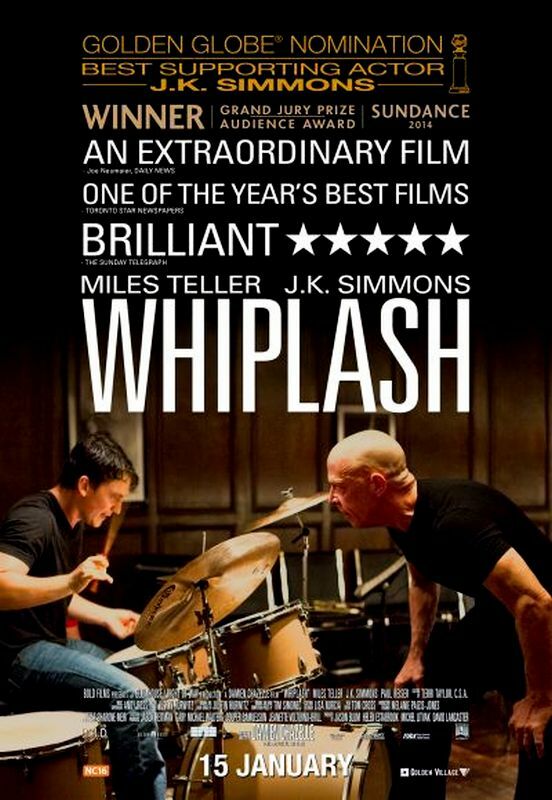 Whiplash is a rare film that manages to be about music and overly romantic about music. It is considerate enough to share the screen time between it’s human characters and it’s musical ones. It should be obvious that Andrew Nieman has talent from the outset of the movie, but his drive to demonstrate his skill at any cost is what makes this a great case study of expression.